"Saskatchewan’s two major parties have unveiled their election platforms. 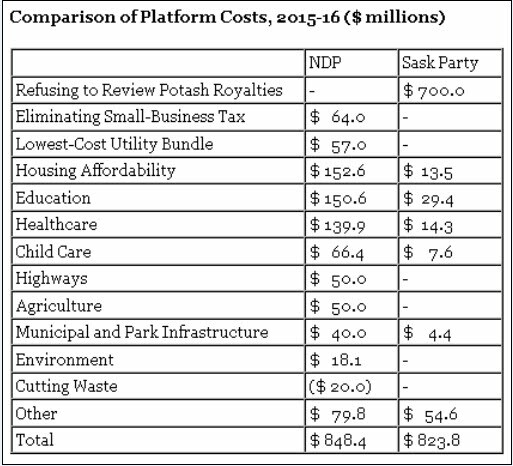 The NDP’s fiscal plan is to collect higher potash royalties and reinvest the proceeds in public priorities like healthcare, education and housing. Columnist Murray Mandryk notes the spectre of Erin Weir. However, as Mike McCracken observes, successful resource-sharing arrangements with the Nisga’a in BC and First Nations in the Yukon took a decade to negotiate. There is no reason to believe that potential Saskatchewan negotiations would affect provincial finances during the four years covered by the NDP platform. The Sask Party’s Seinfeld platform is a collection of miniscule announcements (and re-announcements) that can be funded out of projected budget surpluses. Greg Fingas points out the similarity to Harper’s federal campaign strategy. 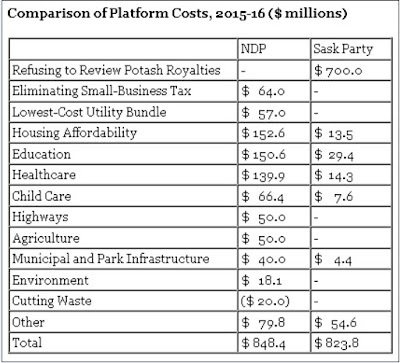 As the following table shows, the main difference between the Sask Party and NDP platforms is not the dollar amount but its allocation among various priorities."